Numbers drawn were: 3 - 6 - 14 - 22. There was no Jackpot winner. We had 2 match 3's who will receive €75 each. Next week's Jackpot is €3,350 and the draw will be held during Bingo on Sunday, April 29. Following the recent U14 Hurling Féile Competition held by Offaly GAA, Clara/Brosna Gael's U14 hurlers will be one of 3 teams representing the Faithful County in this year's Féile. Having played three hard matches in Banagher, Clara/Brosna Gaels qualified for the C semi-final held in the Faithful Fields on Sunday morning, April 22. They played Coolderry in the semi-final and were behind 2-4 to 1-2 at half time but a brilliant second-half performance from a very hard-working group of players saw them victorious on a scoreline of 5-7 to 3-5. Scorers: Marcas Dalton 2-2, Oisin Carroll 2-0, Conor Doyle 0-3, Callum Dunne 1-0 and Barry Egan 0-2. In the final they played Shamrocks and again were behind 1-4 to 1-1 at half time but another brilliant second-half team performance help them to win on the score line of 6-5 to 1-5. Scorers: Oisin Carroll 4-0, Conor Doyle 1-2, Marcas Dalton 1-1, Liam Flynn 1-0, Barry Egan 0-2. Clara/Brosna Gael's U14 hurlers will now go on to represent the Faithful County in this year's Féile na nGael competition sponsored by John West and hosted by Connacht. Clara/Brosna Gaels will hurl in Group D in Division 7 alongside the Cavan outright winners, Castlebar Mitchels (Mayo) and Naomh Eoin (Sligo). This will be a fantastic opportunity for these young men to represent both club and county in a national competition. The John West Féile na nGael is a Club festival for Hurling, Football, Camogie and Handball at Under 14 level, involving teams from across the Association. The John West Féile na nGael National tournaments will be held in Connacht, Longford and Westmeath on the weekend of 8th – 10th June 2018. Clara played Ballyfore on Friday last (20th) in the Junior Football Championship. Clara started well and led 0-03 to 0-02 after 15 minutes. Ballyfore then scored a goal to go ahead but Tony Dalton cancelled this out almost straight away. With 5 mins to go in the half Clara were ahead 1-06 to 1-02. Aaron Ngo then added Clara’s 2nd goal and we led on a score line of 2-06 to 1-03 at half time. Ballyfore got the opening score of the 2nd half. They then had a couple more chances but sent them wide. From here to the end of the match Clara took over. When Tony added his 2nd and Clara’s 3rd goal after 20 minutes Clara were ahead 3-10 to 1-04. Sean Tierney then got the 4th goal and Clara ran out winners on a score line of 4-12 to 1-06. 1. Robert McDonagh for D Ledwith 2. Sean Tierney (1-02) for A Cushen 3. Michael Mitchell for K Mannering 4. Enda Dunne for A Ngo 5. Josh McCloskey for T Dalton 6. Shane Grennan for C O’Keefe. A course for new referees will take place over the coming weeks in Tullamore. It will be provided by the Leinster Council and will run over three Wednesday evenings. If you are interested in becoming a Hurling / Football referee please contact the club. Closing date for nominations is Thursday, April 26. The 2018 Cúl Camps will return to Clara once again from Monday 9th - Friday 13th July. Registration is now open and further details can be found at www.gaa.ie/kelloggsculcamps. Daingean played Kilcormac-Killoughey in the 2nd round of the Intermediate Championship in Cappincur last Thursday evening. This was a tough, tense, and hard fought match from the outset with an extremely high free count on both sides. In the early stages of the first half, it was Kilcormac who edged proceedings when they scored a goal within the first 10 minutes. Daingean slowly came into the game, and with Jamie Hayes leading the line and winning any ball that came into the full forward line. By half time Daingean were winning by a point on a scoreline of 0-8 to 1-4. Although Daingean had not played to their best in the first half and Kilcormac were always a threat, it augured well that 5 out of the starting 6 forwards had scored from play. Kilcormac started the 2nd half to the fore and they scored the first 3 points to go in front on a scoreline of 1-7 to 0-8. However Kilcormac's momentum was halted when they had a player sent off and Daingean came back into the game through a goal from Shane Tierney. Midway through the 2nd half with the score at 1-10 to 1-09 in Daingean’s favour, Kilcormac were still proving difficult to shake off and as they stretched Daingean’s defence it led to a black card for Stephen Burns. Although Daingean still had a numerical advantage, with 5 minutes to go, the score was evenly poised at 1-11 to 1-11. 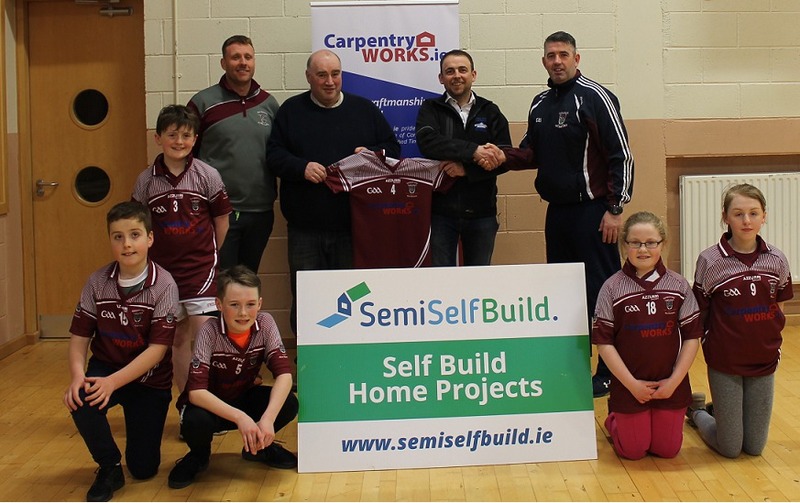 Daingean would like to thank Mark Feely and his company carpentry works on his sponsorship of a new set of jerseys. This was a very generous donation and the jerseys will also be used as the Daingean school jerseys. Congratulations to Thomas Fay and his wife Joanna on the birth of their son Louie Patrick Fay over the weekend. Congratulations to Jimmy Kilmurray (Top Picture) and Tom Kelly (Bottom Picture), the joint winners of the Daingean Last Man Standing competition receiving their cheques from Chairman Pauric Keating. Our U12 girls played Moate in a challenge game last week in Tubber. They travel to play Tullamore Ladies on Tuesday, April 24. Well done to our U14 ladies who defeated Rhode in the u14 League. Huge thanks to our sponsors McManus Pharmacy Clara and John Moran (painter) for providing all our girls with new Club socks and shorts. The annual St. Manchan's Fun Run/Walk will take place on Bank Holiday Monday, May 7 at 3pm at Tubber GAA clubhouse. Registration starts at 12 noon, Over 18s are €10.00, Over 12s are €5.00, Under 12s go Free & a Family is €20.00. All ages and fitness levels are most welcome. Join us for refreshments after in Tubber GAA clubhouse! 36 scores in sixty minutes of football indicates that this game was played without any negativity and for the most part, forwards had the better of defenders. Shamrocks got the first point of the game inside a minute. Chris McDonald replied for Ballycumber with a well taken goal. After Shamrocks added two points, Sean Hackett was on hand to put the ball in the net to give Ballycumber a three point lead. The Rahan parish side then scored five points from play and one from a free to lead by three approaching half time. Ballycumber fought back with points from Joe Lowry and Sean Hackett to leave the minimum between the sides at the break. Shamrocks added two points from frees, to which John Egan and Cormac Quinn replied to with points from play. A Nigel Grennan point drew the sides level at 2-7 to 0-13. Gary Larkin had a good goal bound shot well saved and Joe Lowry had another attempt saved at the expense of a 45 which was missed. Joe Lowry scored two outstanding points after long runs. But, Shamrocks were finding it easier to get scores and as fatigue set in, a number of passes went astray and were punished on the scoreboard. In this period Shamrocks kicked six points from play to lead by 0-20 to 2-8. Nigel Grennan got two more points and had a good attempt for a goal saved on the line and Gary Larkin finished the Ballycumber tally, while Shamrocks had time to add three more points before the final whistle. Team: Leo Guinan, Alan Flanagan, Luke Gavin Mangan, Jack Quinn, John Egan, Ritchie Dunne, Ethan Keena, Chris McDonald[Captain] John Corcoran, Gary Larkin, Sean Hackett, Adrian Kelly, Joe Lowry, Cormac Quinn, Nigel Grennan, Karl Daly, Clive Keena, Tom Corcoran. This game was played in glorious sunshine in Ballycumber on Saturday evening and goy off to the perfect start for the home side with goals from Emmet Kelly and Paddy Cosgrove in the first five minutes. Andrew Grennan added a point before Peter Dunne drove a penalty to the corner of the net and the same played scored a point to extend the lead to 3-2 to 0-1. David Ayres and Peter Dunne added points before Daingean got two points from play and a very well worked good goal. Paul Kelly and Conrad Casey completed the first half scoring. In the second half Paddy Cosgrove scored two more points, Conrad Casey got two more and David Ayres raiding from half back scored 1-2 in a four minute spell to leave the home side clear winners after an enjoyable and competitive game of football. Team: Kyle Cornally, Paul Egan, Brian Halligan, Aaron Daly, Kenneth Delaney, Colin Daly, David Ayres[Captain], Michael Egan, Shaun Creevy, Andrew Grennan, Peter Dunne, Conrad Casey, Paddy Cosgrove, Paul Kelly, Emmet Kelly, Diarmuid Daly. St Manchan Gaels 8-11 Ballinamere Durrow 1-4. Congratulations to Ailbhe Kelly [Castlearmstrong] and Alec Mooney [Doon] who were married in Boher on Thursday. We wish them a long and happy life together. Ballycumber will travel to Geashill on Thursday evening to play against Raheen at 8pm. Ballycumber v Erin Rovers in Pullough on Friday 27th April at 8pm. The numbers drawn this week were 9,23,25,26. No jackpot winner, one match three winner. Next week’s draw will be held in Gussies on Monday night at 10 o’clock for a jackpot of 3600 euros.